Whether you’re remodeling your entire kitchen or looking to add a single upgrade, select products that reflect your personal sense of style. Consider these three trends to personalize your next kitchen upgrade. 1. High-tech culinary coaching: Now, you can easily customize your cooking experience with helpful information offered by smart appliances. 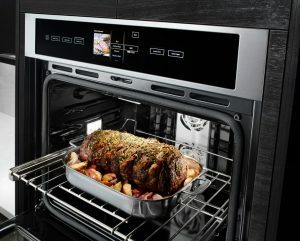 The Jenn-Air Culinary Center houses a gourmet guide within the oven itself that directs meal preparation for more than 50 food options, including desired doneness and the type of pan to use. 2. Color in unexpected places: A pop of color in a non-traditional space such as the exterior door of a range or interior of a fridge is a fun and unexpected design detail. The dazzling Obsidian interior offered in some Jenn-Air refrigerators illuminates food under LED lighting to showcase vibrant colors. 3. Illuminated spaces: Lighting adds a beautiful finishing touch to a room. Think of layering light in the kitchen with task lighting under the cabinet, recessed lighting above a new range and pendants above the island or breakfast bar. Once the right personal touches are selected, consider all the ways you can enhance your kitchen with these functional additions. • Warming drawers provide a great way to keep prepared food hot and fresh. • Built-in coffee systems provide barista-style coffee and free up counter space. • Induction cooking relies on magnetic technology to heat the cookware and uses far less electricity than standard cooktops and ranges. You can boil a pot of water in three minutes. To learn more about how to personalize your kitchen, visit your local Ferguson Bath, Kitchen & Lighting Gallery or fergusonshowrooms.com to request an appointment with a knowledgeable product expert.